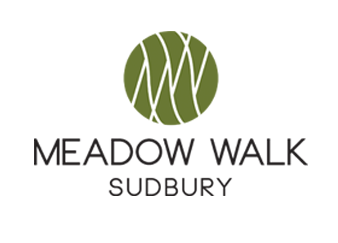 The site work and building construction components of the Meadow Walk project will be completed in phases wrapping up in early 2019. The four Village Retail buildings (35,000 s.f.) along Boston Post Road and Bay Drive are essentially complete. With just landscaping, final paving and other related site work still remaining, the retail shells will be complete in June. Landscaping of the nearby Central Green will be complete in July. 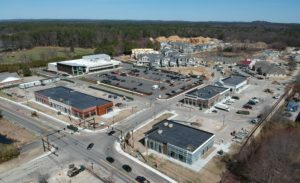 Retail tenant construction will continue throughout the rest of the year. The first restaurant to open will be Oak Barrel this summer, followed by Mooyah Burgers, Paani and Peets coffee. Final paving of Route 20 and Bay Drive (the main access road to Meadow Walk) will happen this summer; we will work with the town police and fire departments to minimize impacts on residents, commuters and tenants. AvalonBay has opened a marketing trailer on site and has started to sign leases with prospective residents. Their clubhouse/marketing/management office, on Bay Drive, will open in first week of May. Avalon’s first residential buildings are also nearly complete and first residents will be moving into to those two buildings in early May. Avalon anticipates opening two or three new residential buildings per month throughout the rest of the year. National Development is in the process of completing construction of their Bridges Memory Care assisted living community. The executive director for the community has been actively doing outreach and information sessions in Sudbury and surrounding towns. The welcome center/marketing offices for the community are located at: 389 Boston Post Road, Located Behind Mill Village Plaza. Staff will occupy the building in June to complete hiring and training staff. First residents are expected to move in during the month of July. 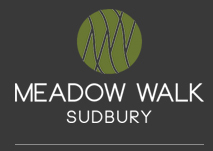 Pulte Homes is close to finishing their model and marketing units for their age-restricted condominium development in the rear of the Meadow Walk development, and will be open for tours starting in May. Pulte’s construction of townhomes and apartments will be on going until early 2019. The Retail Design Institute, the industry’s largest association for retail design professionals, has recognized the WHOLE FOODS MARKET SUBDURY for excellence in design and execution. The project will be inducted into the RDI’s “Class of 2017” at the 47th Annual Awards Gala taking place in New York City. Kudos to Whole Foods and their design team at Jacobs. AS WE PROGRESS WITH CONSTRUCTION, MAINTAINING A SAFE ENVIRONMENT FOR ALL (RESIDENTS, COMMUTERS, TENANTS, VISITORS AND CONTRACTORS ALIKE) WHILE MINIMIZING INCONVENIENCE TO THE GENERAL PUBLIC IS OUR TOP PRIORITY. WE WILL CONTINUE TO PROVIDE FREQUENT UPDATES THROUGHOUT THE CONSTRUCTION PROCESS.